Microsoft Word is a popular Word processor program that allows you to type and save the documents. Million of computer users primarily use it for creating letters, brochures, resumes, tests, learning activities, etc. MS Word tool has many uses and benefits. But on the other hand, it has a major drawback and that’s corruption. Just like any other computer file, Word documents are not immune to corruption. 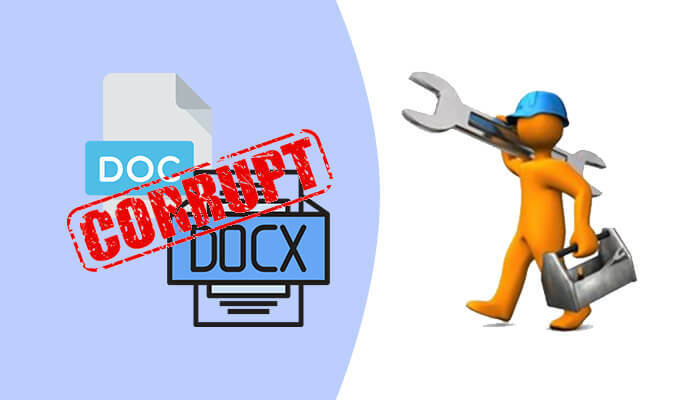 In this post, we’ll learn how to repair corrupted Microsoft Word doc or docx file. To repair Word file manually, all you need to use is Microsoft Word program. Now you must be wondering how MS Word tool can help you here. Actually, there are few built-in features in Microsoft Word program that can help you fix corrupt Word file. The built-in features which you can use here are Open and Repair, Recover Text from Any File (*. *), Insert corrupt Word file into new one, and opening corrupt Word file in OpenOffice Writer or any other Word processor. Step 1: Launch Microsoft Word program on your system. But don’t open the corrupt Word file. Step 2: On the taskbar, click the File tab > Open in the options. Or simply press Ctrl + O. Step 3: On the Open window, select the corrupt Word file, but don’t open it. Step 4: You can see the Open button. Click the drop-down arrow and select Open and Repair in the options. If there’s minor corruption, it’ll repair Word file and open it. But if the Open and Repair trick fails or doesn’t work, you should try another one. Another built-in feature in Microsoft Word program is Recover Text from Any File (*.*). Via this feature, you can successfully recover text from the corrupt Word file. The trick I’m sharing below is quite similar to the Open and Repair trick. Step 4: Click the drop-down arrow shown next to All Word Documents. In the options, select Recover Text from Any File (*.*). The file will be opened containing the recovered text in the blink of an eye. In a case of severe corruption, you could only recover junk characters from the corrupt Word file. In such a situation, you should try to import corrupt Word file into a new one. Step 1: Launch Microsoft Word program and open the new Word file you’ve created earlier. Step 2: On the Insert tab, find the Object section. Click the drop-down arrow and select either Object or Text from File. Choose the “Object” option if you want to insert only the object into the new Word file. On the Object window, click Browse and select the corrupt Word file. Now click OK to insert the objects from corrupt Word file into the new file. Choose the “Text from File” option to insert the text content into the new Word file. On the Insert File window, select the corrupt Word file. You can define the range (optional). Now click the Insert button. There’s one more thing you should try here. You should try to open corrupt Word file in other applications like OpenOffice Writer, WordPad, Notepad, etc. Refer to this article to know how to recover a lost Word document. When no manual trick works for you due to severe corruption, you must look forward to a professional solution. A professional Word Recovery software is designed to handle the extreme level of corruption which you can’t handle via the manual tricks. 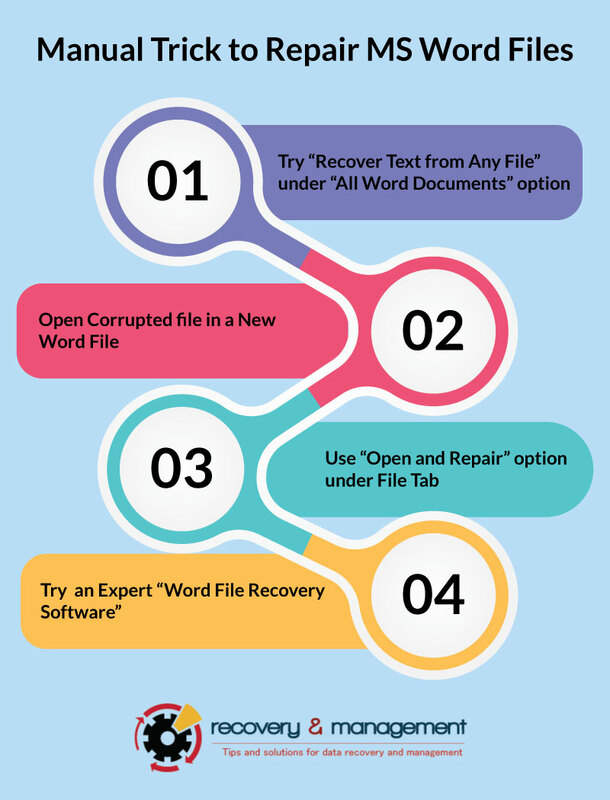 There are many vendors in the market which provide Word Recovery software. And most of them provide demo/trial version for free evaluation purpose. SysInfoTools DOC Recovery software is a smart Word file recovery solution that supports corrupt Word file (DOC) created by Microsoft Word 97 to 2003. So if you’re using Microsoft Word 2003 or any previous version, you must use this software. It can repair DOCX file (single as well as multiple) and recover maximum possible content. Via this software, you can successfully restore text, charts, images, hyperlinks, etc. from corrupt Word file. SysInfoTools DOCX Recovery software is another Word file recovery solution. It supports corrupt Word file (DOCX) created by Microsoft Word 2007 and later versions. So if you’re using Microsoft Word 2007 or any later version, this tool will help you repair DOCX file. You can select single or multiple DOCX files at a time, and restore maximum possible data like text, graphs, tables, formula, images, formatting, Unicode characters, etc. Both these DOC Recovery software and DOCX Recovery software are available with free demo version. Before you can purchase the software, you must download their free demo version. By using the demo version, you can check the preview of your data (both text and images) which you can recover from the corrupt Word file. If you’re satisfied with the results, then only you should purchase the licensed version.